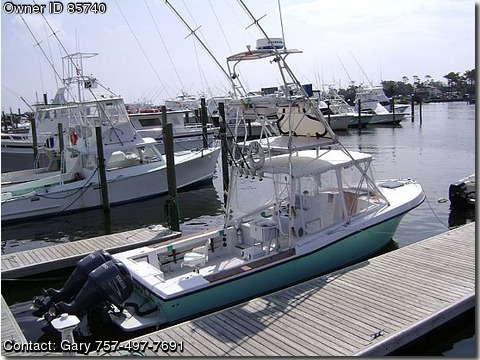 28'4" Mako 1986 Center Console Express in Excellent This 28'4 Mako center console express is powered with twin 2002 200 HPDI Yamahas both repowered in 2005. 1986 hull has been totally repainted and reconditioned in 2006 and has never looked better! Hull is seafoam green w/ Awl-Grip. Top side is Matterhorn white w/Awl Grip as well. All non skid surfaces totally redone. Custom pipe welders 20 ft tower w/Rupp tower outriggers. Tower folds to 13 feet for trailering. Tower has hydraulic steering, Morse throttle, shifter controls, folding seat, buggy top and belly band. Boat is equipped with 2006 VH1 Furuno Nav Net/GPS/fishfinder with a depth of 2500 feet. Lowrance 8" world map GPS and fish finder. 2 VHF radios--1 Icom 402 and 1 standard Horizon in the tower. Also equipped with full curtains and new interior. Transom cut-out has been boxed off with a fish box installed in its place thats also totally setup for a 30 gallon live well. 2 large fish boxes are in the cockpit floor. Florida fuel tank holds 310 gallons. Maximum fuel range is approx. 600 miles. Twin Yamaha 200's are on a 2 foot Armstrong bracket. The bracket is the full width of the boat. Loadmaster tri-axle trailer w/ 10,500 lb capacity has been well maintained and comes with the boat. Everything on her is in great condition. This boat is perfect. for personal or charter use. I'm selling as I purchased a larger boat. The value w/all the options, many not listed, is close to 40k.